SATELLITE CABLE. Coax, Made up satellite cables. 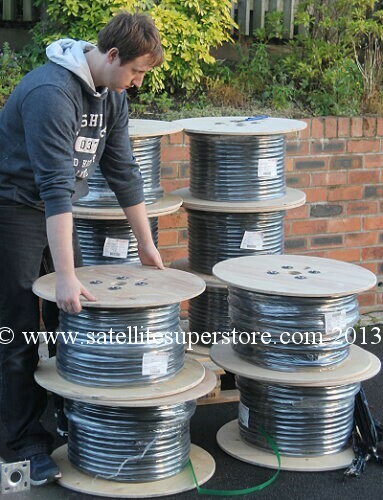 Satellite Superstore UK cable page. 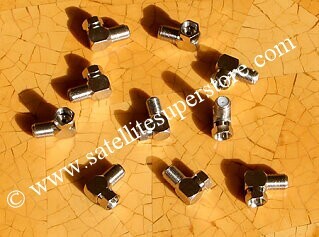 Satellite connectors. Low prices. Big discounts. Cheap cable. After clicking on a link below use the back button to return here to these links. Pages and sections are long so scroll down. High digital specification cable. Made in Germany to very high standards. For connection between LNB and satellite receiver. 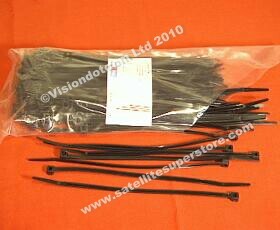 If you have a high quality satellite system - use the best cable. Flexible with similar dimensions to normal satellite cable (use normal F connectors). 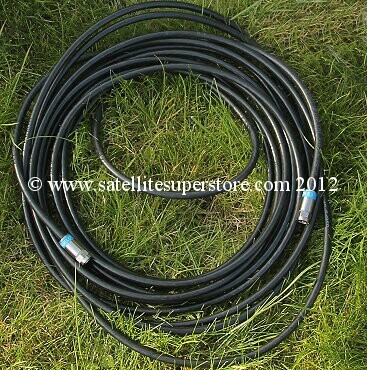 satellite cable but with a high output LNB we have had good results (on a farm) up to 110m! Very low attenuation per metre. Available in black or white. White can be better on light coloured houses or indoors against skirting boards. 7mm Diameter. Fits our professional compression F connectors below. 1. Add one metre to the cart. 2. Go to the top of this page and select "review cart". 3. In the "Qty" (Quantity) box change "1" to the number of metres required. 4. Then click on the "Modify Cart" button to update the quantity (the price is also calculated in the total column). 5. Then select "Previous Page" to return to this page. For more than 50m see below. For made up lengths with connectors fitted, see below. Scroll down for quantity prices. Ultimate Digi Cable. Quantity prices. Please note that this cable comes on 500m reels so the 50m is cut off the reel for you. Please note that this cable comes on 500m reels so the 100m is cut off the reel for you. 100m of White Ultimate Digi cable. (95p/m). 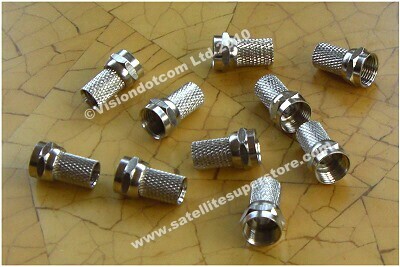 See pictures of these very high quality compression F connectors below in the connectors section. 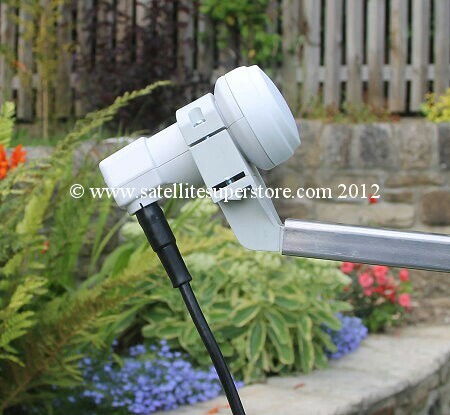 Ideal for use between the LNB and the satellite receiver. Compression F connectors do not need tape. They are completely watertight and are tested to 2 bars of pressure under water. Cablecon connectors are the best available. one end of the made-up cable from male to female. Any length can be selected by using the options below to add extra meters of cable to the required made up lengths. 7mm single clips to fit this cable are below. Option - Add an additional meter of black UDC digi cable to my made up length. This option is only available if you have already added a made up cable to your shopping cart. You should select the made up length that is the nearest (lower length) to what is required so that you can add to it. So select this option several times until you have increased the made up cable to the required length. e.g. you need 23m? select a 20m length above and add this option 3 times to make up the 23m. Option - Add an additional meter of white UDC digi cable to my made up length. and gold screw on F Connectors. The picture above shows the outer screen, the foil and the inner core. For connection between LNB and satellite receiver. Solid inner dielectric core so that moisture cannot get in. (Low grade cable is air cored.) 7mm single clips to fit this cable are below. Webro WF100 is high quality digital cable. Black Webro WF100 satellite cable (single). 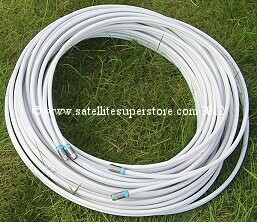 White Webro WF100 satellite cable (single). 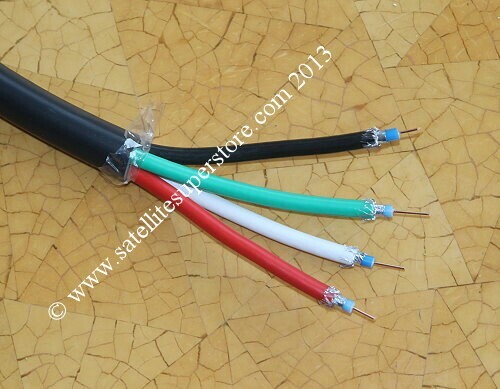 Triax RG 6 low cost satellite cable. A lower cost alternative when there is a limited budget. 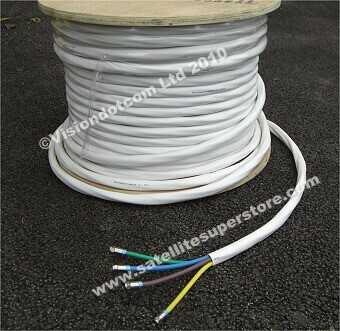 Good quality foam filled cable for IF (dish to receiver) or UHF (distribution round house) use. 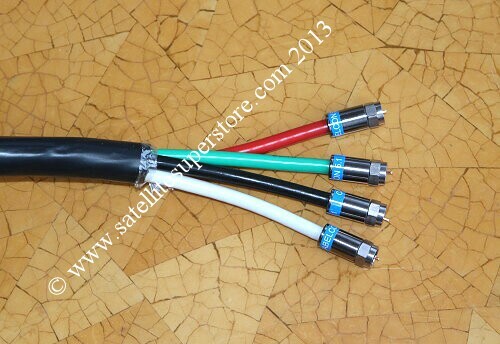 Much better quality than brown UHF cable for UHF use. Available in black or white. White can be better on light coloured houses or indoors against skirting boards. 7mm single clips that will fit this cable are below. 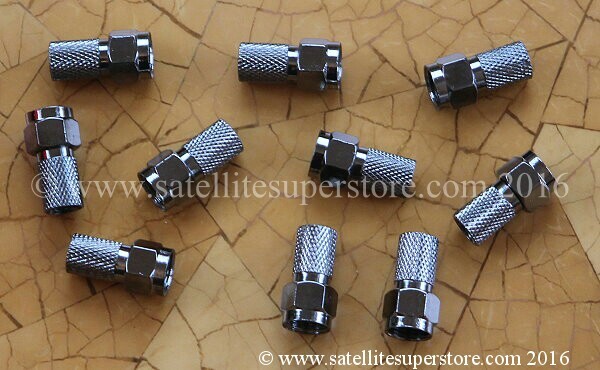 RG6 cable requires 6.5mm F connectors. 2. Go to the top of this page and select "review your cart". Black RG 6 digital cable. Per metre. 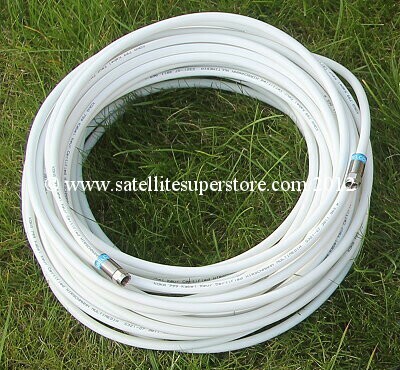 White RG 6 digital cable. Per metre. Triax RG6 cable. Quantity prices. connector. 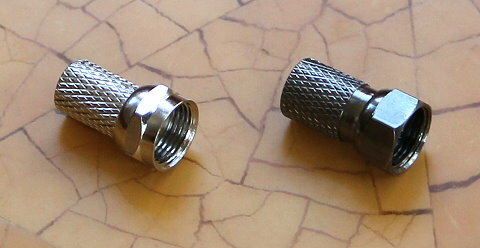 This can be push fitted or removed if male connector at both ends are required. 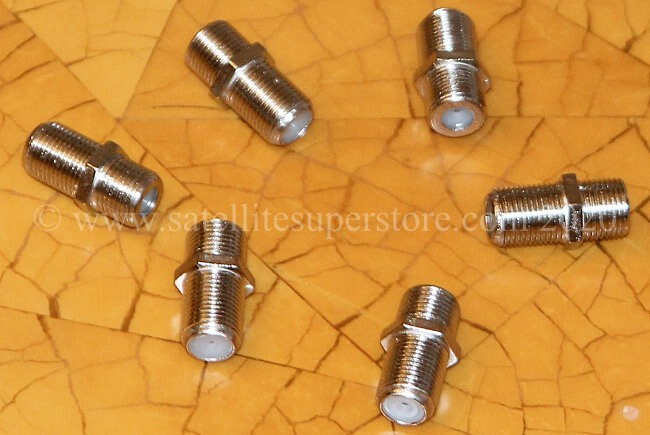 See the high quality screw-on UHF connectors below. 7mm single clips will fit this cable and are below. 1m of White RG 6 cable made up with screw fit UHF connectors. 20m of White RG 6 cable made up with screw fit UHF connectors. Option - Add an additional meter of black RG6 cable to my made up length. Option - Add an additional meter of white RG6 cable to my made up length. Please note - grey clips are available for this cable. Highest quality - Low cost - 4 wires (4-core) - grey. But for over 20m (and reels) please choose either the standard �10 option or the "by weight" priority option. If added to a system, choose the �by weight� option and a total price is worked out. 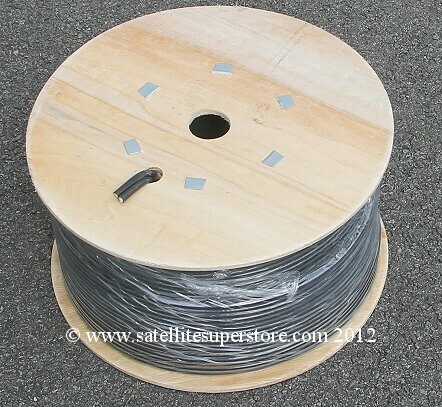 Sold per metre - Grey 4 core motor control cable. Sold per metre - Grey 5 core motor control cable. Grey 4 core motor control cable. Quantity prices. Primesat 4 LNB cable. Black or white. This cable could be used with quad LNBs, quatro LNBs, two twin LNBs, or 4 single LNBs. Diameter 17mm. Each cable is 7mm as so it fits our screw on F connectors and our professional compression F connectors. unless made-up lengths are selected below. Then they are fitted for you to the black or white cable. This cable is colour coded which makes it easy to identify if used with a quatro LNB and a multiswitch. If cut to the required length, priced per metre. This cable is heavy. Only courier options are available with this cable. Clips to fit this cable - use 17mm clips for cold water pipe. 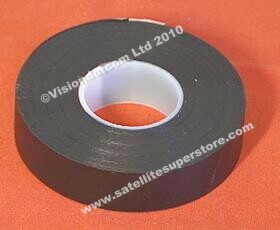 Primesat black 4 LNB cable cut to required length. Primesat "Hamburg" white 4 LNB cable cut to required length. Primesat 4 LNB cable. Quantity prices. 8 Cablecon professional compression F connectors. Option - Add an additional meter of 4lnb quad cable to my made up length. Option - Add an additional meter of black 4lnb quad cable to my made up length. 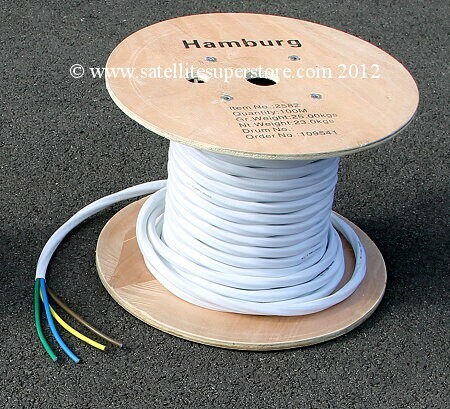 Option - Add an additional meter of white "Hamburg" 4lnb quad cable to my made up length. Each core is 7mm diameter. 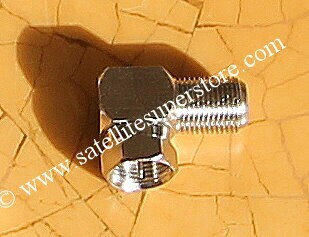 Fits our screw-on and compression fit F Connectors. We do not sell the thin poor quality twin cable. 7mm by 14mm twin clips to fit this cable are below. Made-up lengths of Twin Cable using compression F connectors. High quality Webro Twinsat WF100. 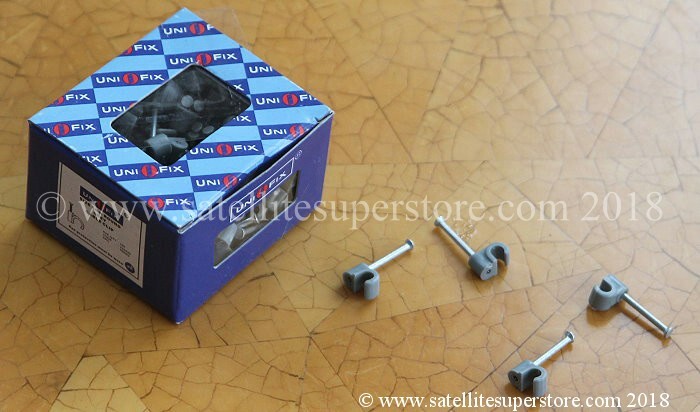 Ideal for use between the LNB and the satellite receiver.Compression F connectors do not need tape. Option - Add an additional meter of white Webro WF100 twin cable to my made up length. Option - Add an additional meter of black Webro WF100 twin cable to my made up length. If you need to feed a cable through a window without wanting to drill any holes, this flat cable adapter is ideal. Flexible and flat. Total length - 220mm. Length of flat flexible section 170mm. 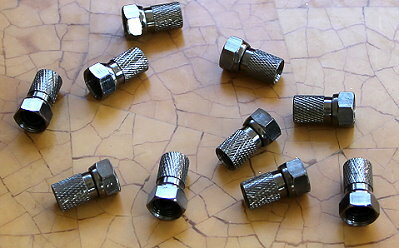 Female F connector sockets on the ends so connect to the ends with normal male F connectors. 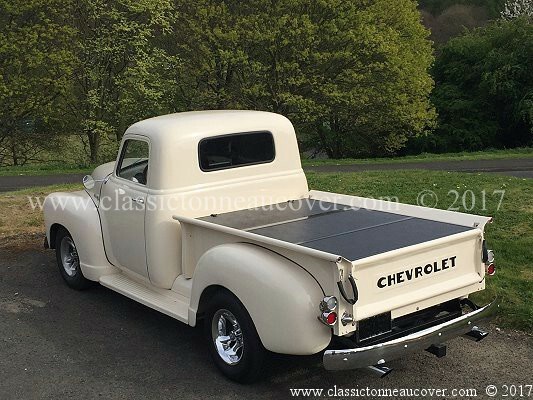 Minimum order value for free UK shipping is �10.00 but you can select a delivery charge. 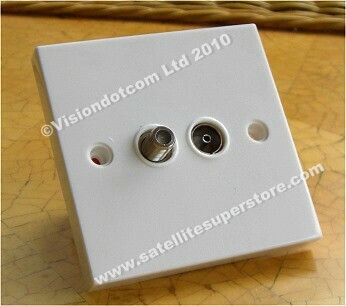 External wall plate cable hole covers. is protected from water which might otherwise travel along the cable and into the house. Available in 3 colours - brick colour, white and black. 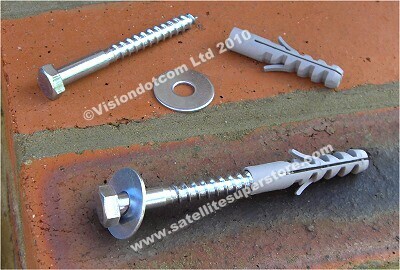 For tidying up the hole internally if a wall plate is not being used. Available in 2 colours - white and black. Available in two sizes - single and twin cable. White wall tidy - single cable. Black wall tidy - single cable. White wall tidy - twin cable. Black wall tidy - twin cable. Quantity price. bag of 40. 10 white single, 10 white twin, 10 black single, 10 black twin. Notice the difference! Large nuts. Heavy. Shown above right are standard F Connectors. These F connectors contain O rings to help to stop water from getting inside. However, amalgamating tape is still recommended. These are a very high quality F connector compared to the standard type usually sold elsewhere. The whole connector is larger and heavier. This 7mm F connector fits all of our high quality 7mm cables. 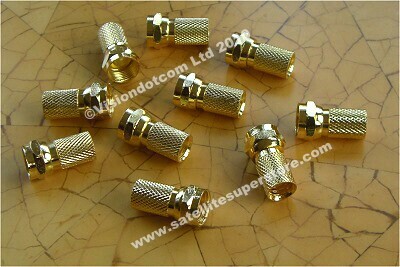 Shown below are 6.5mm connectors and gold plated 7mm connectors. Antiference Primesat 7mm twist on F Connectors (with "O" ring seal). Special offer. 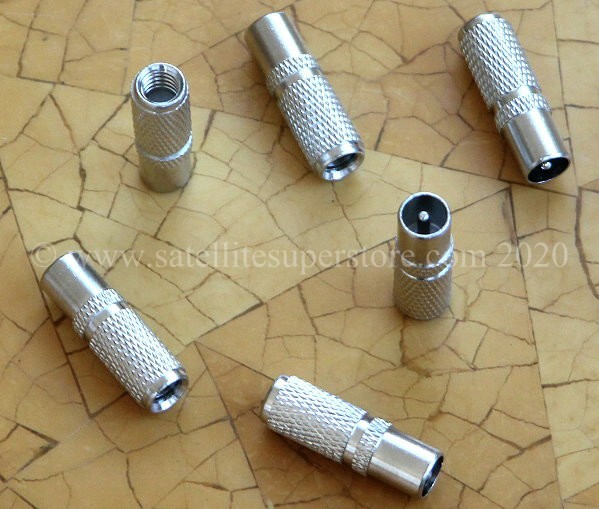 10 Silver Antiference 7mm F Connectors (with "O" ring seal). If you require more than one please "add to cart" several times or see 10-off and 100-off offers below. the left and a heavy duty connector with o ring on the right. for a higher performance connection. If cut with a knife or other type of tool, the cut may damage or cut into the copper. F connectors above or the professional compression fit F connectors below. See the picture above and compare the difference! 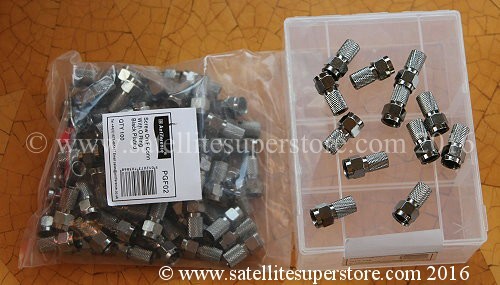 Very high quality professional F connectors - in your hand they feel heavy. compression fit is a better and more reliable connection. As usual, Satellite Superstore offers you the best products available. far. The stripper cuts to the correct depth for a higher performance connection. Buy as a kit and save money. 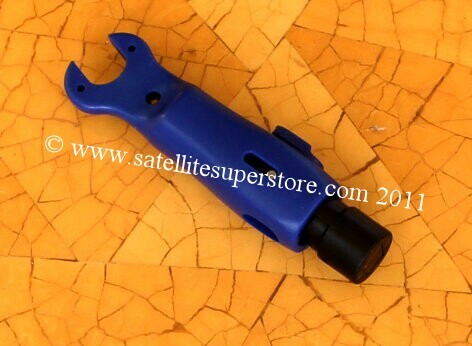 This cable stripper can be used to prepare cable for screw-on F connectors and compression-fit F connectors. Compression tool with 10 compression F connectors. synthetic material. See bottom left and in the LNB picture. Fits all of our F connectors. Select "Change Quantity" box after adding to cart. connector from water / rain. The plastic outer clips on. This makes for very fast fit and remove. and is 100% watertight if fitted correctly on the correct size of F connector and cable. 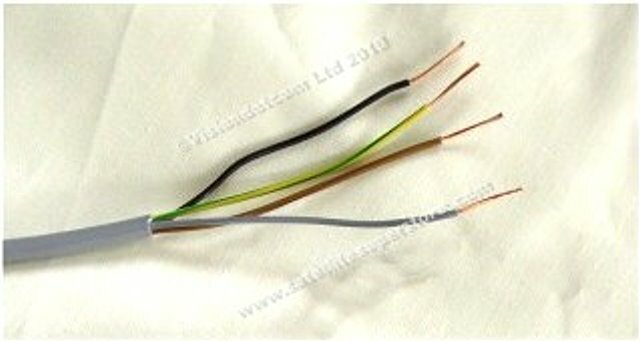 Typically suitable for 6.5mm and 7mm cable and connectors. Fits all of our F connectors and cables. adding to cart. or order quantities below. Also see the 10-off quantity price below. F Connector back to back coupler. 1. Joins two F connector cables together. 2. Turns a mail F Connector plug into a female F connector socket. 1. Add one to the cart. 3. In the "Qty" (Quantity) box change "1" to the number of connectors required. 1 F Connector back to back coupler. Push fit F connector adaptor. Converts a normal F connector to a push fit F connector. is going to be disconnected on a frequent basis. E.G. a test bench, a caravan dish cable, a satellite meter lead, etc. In the picture you can see the fast fit F connector adaptor fitted to both a compression F connector and a screw-on F connector. Converts a normal F connector to a right angle F connector. Ideal if space is limited behind a satellite receiver and the wires need to exit sideways. 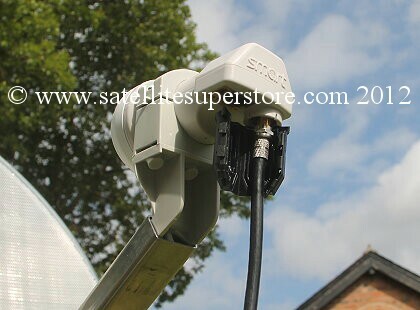 Ideal for connecting to unused LNB outlets. VERY high quality connectors. Very quick to use. MUCH better than the normal type. These are heavy gauge precision made one-piece screw-on connectors just like a screw-on F connector. If you require more than one please "add to cart" several times or see 10 off offer below. Professional twist on UHF Connectors. UHF Connector back to back coupler. 1. Joins two UHF connector cables together. 2. Turns a mail UHF Connector plug into a female UHF connector socket. AV Leads and mains leads. 6 way mains anti-surge mains extension lead are on the accessopries page. wall mounts & ground stands on our site. 10mm drill required. pulled through the fixing holes in the wall mount. add to cart several times or see quantity prices below. 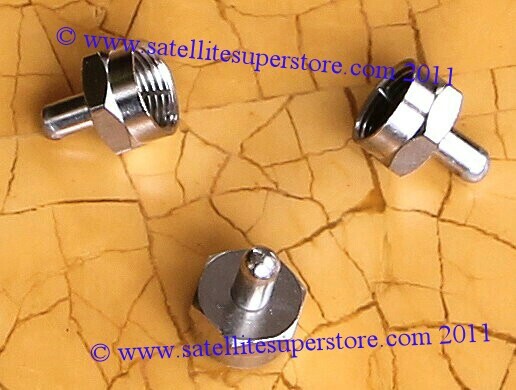 1 set of coach bolt with plug & washer. Europlug 2-pin to 3-pin adapter. 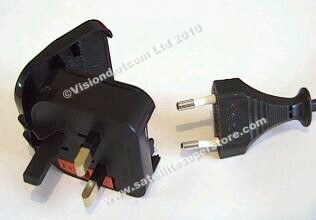 At last a solution to the 2-pin plug on your new satellite receiver. No need to cut off 2 pin plug an invalidate warranty. Simply put plug into 3-pin housing. Closing clamps it in place. 2 rolls of waterproof tape. Fits all of our single and twin cables. 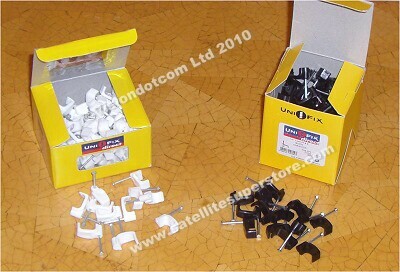 Black or white clips, Box of 100. 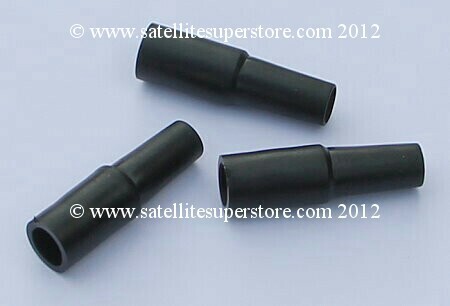 BLACK 7mm single cable clips. Box of 100. WHITE 7mm single cable clips. Box of 100. 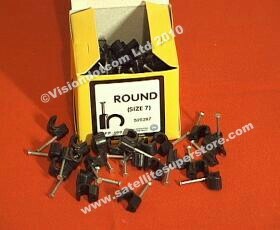 BLACK 7mm X 14mm double cable clips. Box of 100. 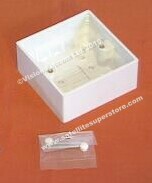 WHITE 7mm X 14mm double cable clips. Box of 100. Ideal for the motor control cable. 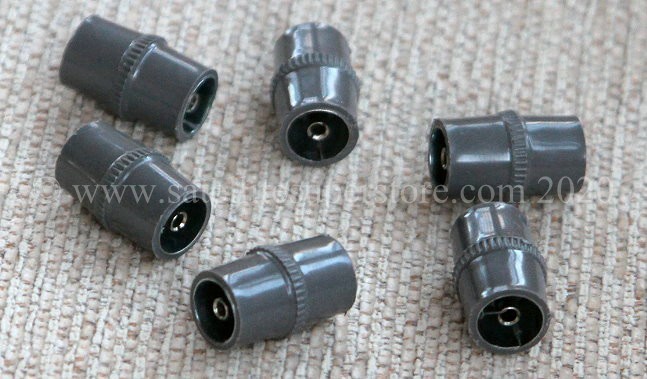 Grey 5mm clips, Box of 100. Fits our motor control cable. 5mm cable clips. Ideal for the motor control cable. Single F connector outlet plate. For fitting on the internal walls as a dish point socket. A surface back box is available if required. 1 single output F connector outlet. This is a high build quality product. Back box above if required. 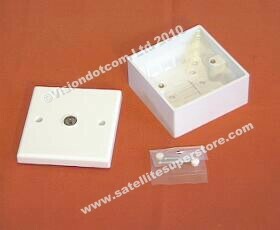 The twin outlet plate is ideal for Sky + and sky HD or any twin tuner receiver. 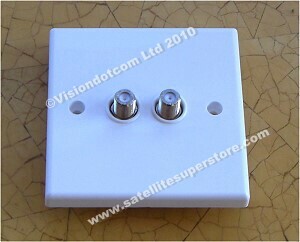 Whilst it may be possible to buy cheaper twin outlet plates, these are the high quality "Maxview" type. Double output F connector outlet plate. Back box above if required. Low cost output F connector outlet plate. UHF outlet plate. 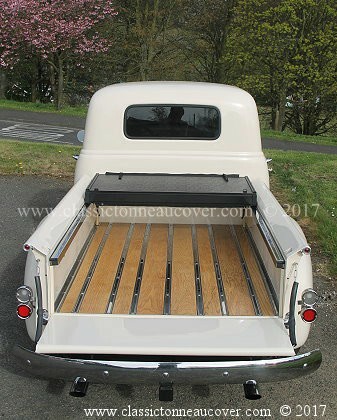 Optional back box. the Sky Digital TV eye systems. Triax F and UHF outlet plate. This is not a diplexing plate for use with a multiswitch for sending the two signals down one cable. (That plate is below.) This is two separate connections for two cables. See above for back boxes. 4 Triax F and UHF outlet plate. Quantity price. 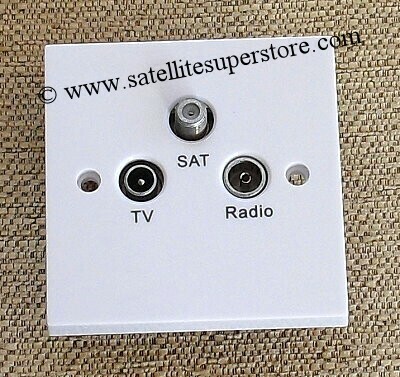 Triax UHF and Satellite outlet plate. 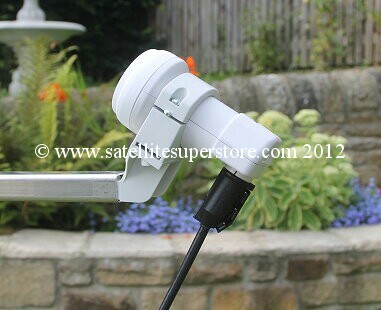 This unit allows one cable to carry the UHF TV aerial and satellite (e.g. from a multiswitch) to a room. room using a second cable. Available from the Multiswitches page. 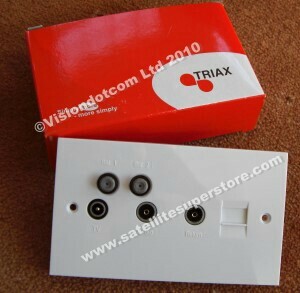 Triax UHF and TWIN Satellite outlet plate. 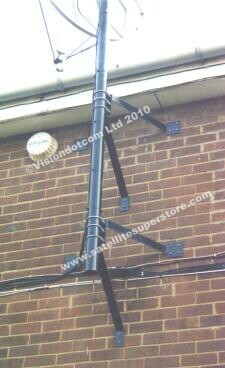 This unit allows one cable to carry the UHF TV aerial and satellite (from a multiswitch) to a room. A second cable from the multiswich carries a satellite signal for a second receiver or twin tuner receiver. using a third cable. Available from the Multiswitches page. 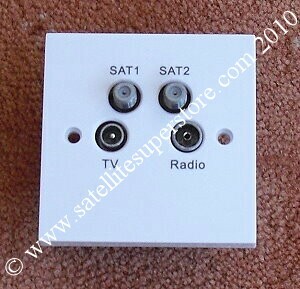 Triax UHF, phone and TWIN Satellite outlet plate. signal to the room using a third cable. A telephone point is also included. Available from the Multiswitches page. UHF distribution amplifiers are on the accessories page. Vision ground stands. 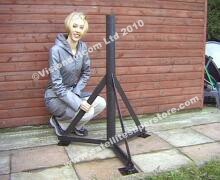 Folding ground stands for CARAVANS.